The municipality of Yumurtalik (17,929 inhabitants in 2012, 5,110 in the town of Yumurtalik; 55,395 ha) is located 40 km of Adana. 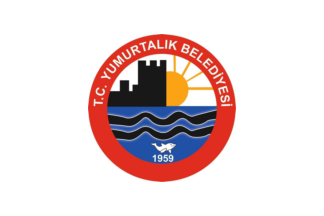 The flag of Yumurtalik (photo) is white with the municipality's emblem. "T.C." 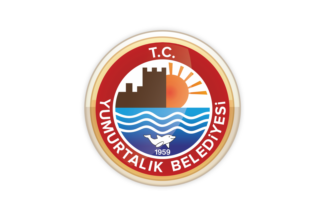 stands for "Türkiye Cumhuriyeti", "Republic of Turkey"; "Belediyesi" means "Municipality". The former flag of Yumurtalik (photo, photo) was white with a slightly different emblem. The emblem must represent Süleyman's Tower, a watch tower built in 1536 to protect the port, then known as Ayas.